I would like to connect pairs of chord endpoints by noncrossing paths on the surface of $S$ so that the paths + the chords form a cycle. I can prove (for example, by induction) that this is always possible if I am permitted to use arbitrary paths on the surface. But what I would really like to achieve is connecting the chord endpoints by noncrossing arcs of great circles. Henceforth consider the chords to pass exactly through the center of $S$, but pretend they do not intersect there. An example is shown left below, where three axes-chords are connected into a cycle. The example right below of coplanar chords shows that what I want to achieve is not always possible. Q. 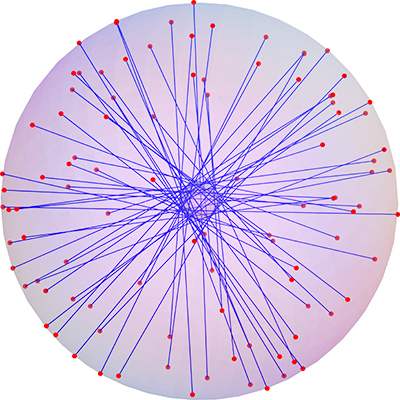 Under what conditions can a set of chords through the center of $S$ be connected into a single cycle by noncrossing arcs of great circles? In particular, can this be achieved if no three chord endpoints lie on a great circle, i.e., are in general position in this sense? There is a considerable literature on noncrossing geometric matchings in the plane, but I don't see that it applies to my question. Any pointers, ideas, or counterexamples welcomed! Among the perfect matchings (with great-circle arcs) that give a single cycle when combined with the chords, consider the one that has minimum total length. Suppose that two of the arcs are crossing, say AB and CD cross at the point X. Then consider replacing these two arcs either by AC+BD or by AD+BC. One of these possibilities (say AC+BD) must again give a single cycle when combined with the chords. And except in "degenerate" cases, the total length of AC+BD will be smaller than that of (AX+XC)+(BX+XD) = (AX+XB)+(CX+XD). 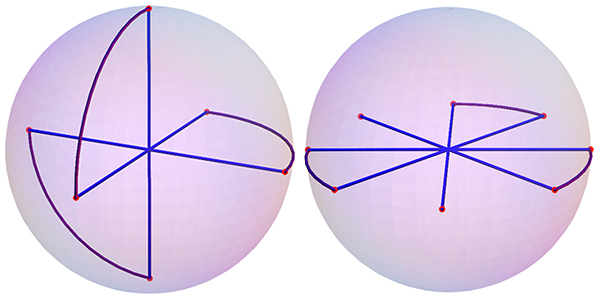 The contradiction shows that if the points are in "general position", the desired non-crossing matching with arcs of great circles is possible. Not the answer you're looking for? Browse other questions tagged reference-request mg.metric-geometry discrete-geometry perfect-matchings or ask your own question. What is determined by the combinatorics of the shadows of a convex polyhedron?